Do you struggle to sit down and get on with your academic work? 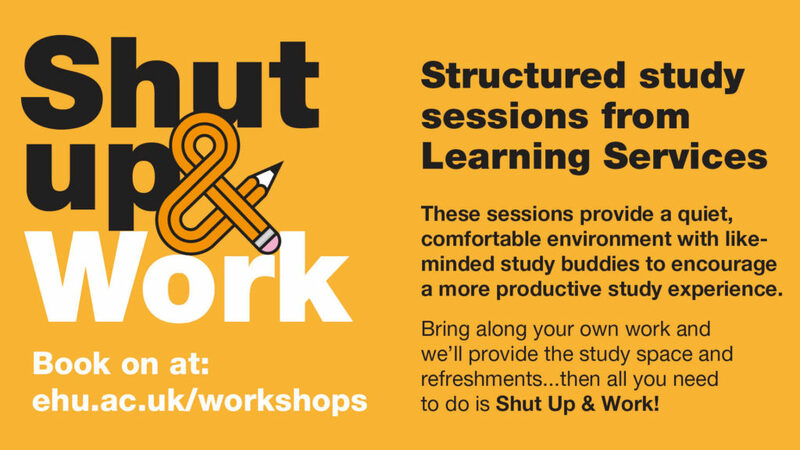 If so you may want to come to one of our Shut Up and Work sessions. These are based on the Pomodoro Technique which involves working for 25 minutes, then taking a 5 minute break, working for another 25 minutes, etc. We will provide the study space and the refreshments; all you have to do is bring a piece of work that you are working on. The sessions will take place on the next 3 Tuesdays, 6th, 13th and 20th March between 10am and 12pm. If you can’t make the date, why not take a look at some of the other UniSkills workshops running this Semester? These include important topics such as academic writing, dissertations, searching for information and exam preparation. This entry was posted in Learning Services by Kate Johnson. Bookmark the permalink.